Much of it was a vast, level prairie broken up only occasionally by rolling hills and the breaks of small creeks and the Republican, Arickaree, and Platte rivers. Roughly, Custer’s patrol area covered the modern day expanse reaching from Sharon Springs, Kansas; north to Julesburg, Colorado; east to North Platte, Nebraska and south to Hays, Kansas. It was a beautiful land, a harsh land, and without a doubt a tough ride on horseback… I know, I have traveled it on a harvest combine and behind the steering wheel of a grain truck. And yes, just a little bit of it on a horse’s back. I found this old picture in my fathers things. My grandfather John M. Ryan owned some wheat land between Goodland and Brewster,Kansas. It was in the general vicinity of the turnoff north to the Kuhrt farm and the Kidder massacre site. My father pointed the land out to me many years ago. There was a dairy on it then. I think this picture may have been taken on that land. Lt. Colonel, George Custer (formally a General) left Ft. Hays, Kansas on June 1, 1867. He led a 1,100 man contingent of the 5th Cavalry. His mission was to put a stop to the Indian raids and punish the Indians severely. 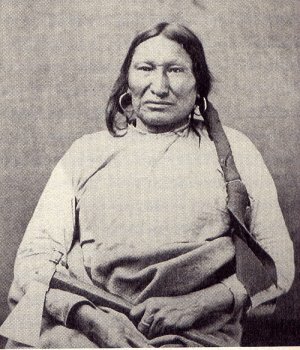 He traveled north to Fort McPherson near the location of modern day North Platte, Nebraska. From Fort McPherson he took his cavalry back southwest to a point where the Arickaree joins the Republican River. It was near the location of present day Benkleman, Nebraska. He set up a camp there for a few days. At some point Custer sent a 50 man wagon train south to Fort Wallace, Kansas to get supplies. 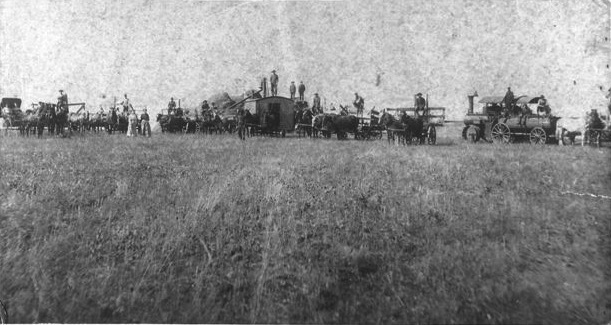 On the return trip the supply train was attacked at, or near the crossing of Beaver Creek by a group of Sioux under the leadership of Chief Pawnee Killer. The attack was repulsed with the help of a relief force sent from Fort Wallace and the wagon train returned to Custer’s camp with supplies. Custer continued to scout the forks of the Republican River. He sent a ten man detail under the command of a Major Elliott to Fort Sedgwick on the Platte to obtain new orders. Elliott returned with no new orders or information. On June 29, 1867, the day after Elliott left Fort Sedgwick, new orders and a dispatch from General Sherman was received. The commanding officer of the fort organized a new ten man detail to be led by 2nd. Lieut. Lyman S. Kidder and guided by a friendly Sioux named Red Bead. Kidder and his detail left that morning for Custer’s camp. Near the abandoned campsite they struck the recent trail of the supply train and apparently thought that Custer had traveled south towards Fort Wallace. One logical reason Kidder made the mistake was that his detail probably reached the trail after dark. As a result, Pawnee Killer’s braves and Cheyenne Dog Soldiers caught them on the open prairie. It was later determined that hey made a running fight for about two miles until they came to a small ravine near the Beaver. They made their stand there and were wiped out by the overwhelming force of Sioux and Cheyenne. Custer continued to scout the area northwest of the Republican River forks. He arrived at Riverside Station forty miles west of Fort Sedgwick on July 5. Using the newly constructed telegraph, Custer immediately telegraphed Sherman at Fort Sedgwick for new orders. He learned of Kidder and that Kidder may have ran into a large Indian force. Kidder’s order was to find Custer. Now, Custer was to look for Kidder. On July 10, Custer’s advance scouts found two dead army horses on the trail. Further on they observed buzzards circling above the Beaver Creek crossing. Custer immediately sent out a search party. One of his Delaware Indian guides came upon the bodies and gave the signal. The bodies of the 11 soldiers and the Indian Scout were found piled together. It was estimated they had died 9 or 10 days previously. The bodies were mutilated and desecrated by the Indians. Custer could not identify any of them at the time. His troops buried them in a mass grave on a level area above the creek. The bodies were exhumed in late February 1868 and reburied at Fort Wallace. Lt. Kidder was identified by his father and taken home for a funeral and burial in the family burial plot at St. Paul, Minnesota. I first visited the Kidder Massacre site as a child and revisited it about twenty years ago. It is on private farm land. If you visit remember that, and treat it with respect. Pull off I-70 and visit the town of Goodland while you are there be sure and visit the Sherman County museum. The town is aptly named. On down the railroad tracks, take a look at the huge concrete grain storage bins. For years if not decades the United States’ top export was grain and agricultural products. Western Kansas and its neighboring states have contributed their share. It is one of our favorite places to visit along the Sundown Trail. 2. 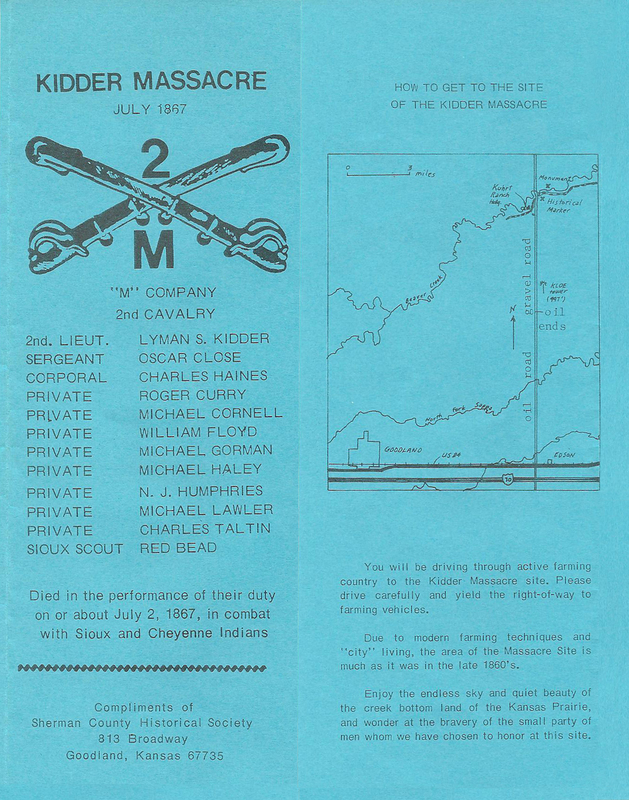 Lt. Kidder was just a month short of his 25th birthday. In spite of his youth, he was a seasoned soldier. He had joined the Union army and served as an under age enlisted man during the Civil War. 3. Kidder later joined the Minnesota Volunteers with the rank of Lieutenant and fought the Northern Sioux in several battles in Minnesota and the Dakota Territory. 4. Most of the ten men were in their late teens or early twenties. All had been in the Army and on the Plains for at least a year. 5. Kidder’s father identified his son’s body by his shirt collar. The Indians had left it on the body, cutting the remainder of the shirt off. His mother had made the shirt for him. 6. 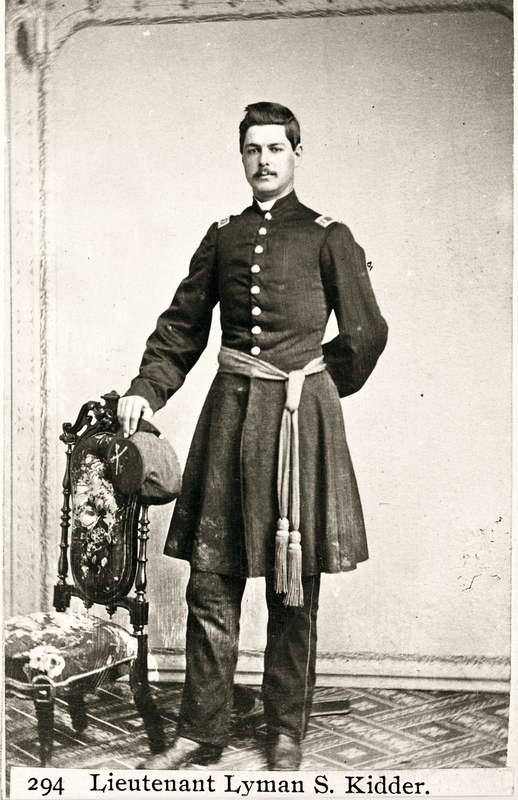 Lt. Frederick Beecher led the reburial detail in February 1868. Kidder’s father accompanied the group. Beecher was destined to die later that year in a fight with the Indians on up the Arickaree River (now labeled a creek). It is kind of hard to feel any sympathy for these men though I am sorry for the family members that were left behind. They were after all invading someone’s territory. Would you stand idle if someone new invaded today or would you resist? Thanks for your comments. I visited your website. Enjoyed the excellent photography. Thanks and best wishes. Thanks. I have enjoyed reading about your love of the land. It is inspiring. These men were soldiers carrying out the orders of their superior officers and United States government policy. They are no different than the U.S. soldiers sent to Iraq and Afghanistan. Soldiers go where they are told and fight whom they are told to fight. They deserve to be honored and revered. At least one of those soldiers was captured and then burned alive. We would classify that today as a war crime. Don: Your point is well made. Thanks. Best wishes from the Sundown Trail. Glad to have found this website. So much interesting history and alot of great old photos. I’m making plans now for some weekend trips. As a born Kansan, 60 years this year, I had never heard of the Lt. Kidder and party massacre. So much history everywhere to learn about.